Home /Science/How many nuclear weapons exist in the world today? 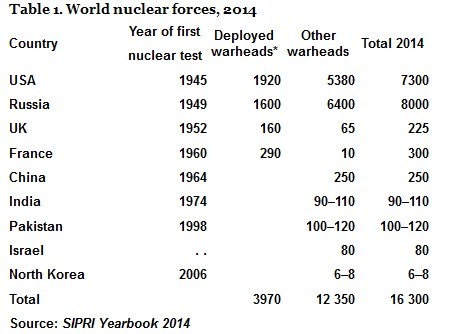 Yesterday, Stockholm International Peace Research Institute (SIPRI) announced that although the number of nuclear warheads summed from all the countries of the world is getting smaller, but the decline rate is slower in recent years. This achievement was possible thanks to the agreement between Russia and US, which together account for over 93% of the entire nuclear arsenal of the world. In 2014, the total number of nuclear warheads in the world was around 16,300, with almost 1000 warheads fewer than in 2013 (17,270). To get an idea of the rate, you should know that in 2011 there were 20,530 active warheads and in 2010 there were 22,600 nuclear warheads. SIPRI warned that this slow decrease is not synonymous with a true commitment made by the nuclear powers to reduce their nuclear arsenals, but rather an attempt to postpone the problem and change the public’s perception. Shannon Kile from SIPRI believes that the nuclear weapons will remain “deeply embedded elements of their strategic calculus”. United States had 7,300 and Russia had 8,000 nuclear warheads at the beginning of the year, according to the Institute;s numbers.